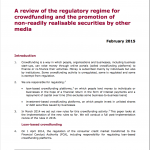 The Financial Conduct Authority publishes its crowdfunding review. Turbulence in the markets spawned a new industry for capital markets in 2012 called Equity crowdfunding, which as of now has transacted £67m of equity investment in the United Kingdom, according to statistics from AltFi, a data provider. TrillionFund, Crowdcube, Seedrs and SyndicateRoom represents the largest platforms that are etching their footprint in the landscape, as such 35 smaller start-up platforms are following their path and up to 10 of those are in the process of being evaluated for licenses. Early on the Financial Conduct Authority recognized the vital importance of facilitating capital formation in markets that were effectively broken or inefficient. Unlike sites such as Kickstarter, where donors contribute money to projects often in exchange for token “rewards”, equity crowdfunding allows investors to buy shares in the companies. This can be a little more risky than another blossoming area, peer-to-peer lending which shortens the time line for the lenders to receive a return on investment given the nature of the risk profiles of the borrowers. A study last year indicated that some 62 per cent of funders on equity crowdfunding sites have no experience of early-stage investment which heightens the regulators caution towards investor protection rules. “A light touch approach” was the thesis behind the initially published rules in March 2014 and was broadly embraced by most industry participants. In stark contrast to the United States, the FCA made a conscious decision to allow the nascent industry to grow and evolve without unbearable rules. The FCA affirmed, “they see no need to alter course” as things as the marketplace is evolving. This publication provides a complete high level overview to the UK market with the expectation being that a more complete review will be conducted in 2016. The FCA is keen to promote innovative financial technology as well as individual investing in the stock markets, and is understood not to want to kill off the fledgling sector. However, the FCA has warned investors “it is very likely you will lose all your money” in equity crowdfunding, which involves taking stakes in unlisted companies that are often in their early stages. Some companies failed to meet capital requirements last year, while others made misleading claims that they were placing retail investors on an equal footing with venture capitalists, the FCA said. “This becomes significant if venture capitalists are able to profit from successful investment opportunities but crowdfunding investors find, when an investment succeeds, that equity dilution means they do not share in the profits to the same extent,” said the FCA. To read the published review click here.